I learned a few things from this experience. First, seventeen-hundred words a day is a bit much for me as a full-time programmer, husband, dad and part-time writer. A thousand words per day is a much more realistic goal. That said, a thousands words a day doesn’t seem so bad anymore. As a matter of fact, it’s a cake walk after this lesson in brutality. A thousand words a day for ninety days gives me a ninety-thousand word manuscript in three months. That’s a decent-sized novel. Add three months of rewrites and editing in and there’s a novel finished in six months. That’s pretty good progress, as far as I’m concerned. 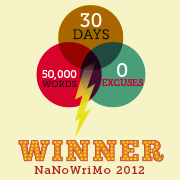 For anyone interested, I’m taking part this year in NaNoWriMo, or National Novel Writing Month. I have a few friends who’ve been talking about writing novels for some time now, so after a few too many Miller High Lifes at a July 4th party, I put the NaNoWriMo challenge out there. They accepted and, well, here we are. I’m taking a little time out of my NaNoWriMo word crunch (I’m only slightly behind the eight ball now) to toss up a quick post about The Desolate‘s recent cover change. I noticed over the following few months after The Desolate‘s release that the stock photo I’d chosen for the cover was a pretty popular image. Too popular, in fact. I saw at least two other books with the same image on their covers. When I received a piece of promotional email using the same image I knew that I needed to change my cover. I needed something that would differentiate my book, not confuse my book with others’.